It was Christmas Day, 2012. I sauntered into the checkout line of the downtown Powell's Books with a copy of It's Okay to Be the Boss. I had struggled to find a book that spoke to my experience or at least didn't alienate me. When I reached the counter, the clerk looked at me, then looked at the book, then looked back at me. "Time to be the boss, huh?" "I actually started a small publishing company in 1996." He was increasingly interested. "Which one?" I didn't expect the conversation to go in this direction. I felt as anonymous and uninteresting as the hundreds of other shoppers that day. Bookstore chatter has always been a welcome part of my life, but the way that my company had been run by its former management for the past six years had dug a ditch of debt so deep and produced a constantly conflicting composite of statements about what the company stood for that I had become embarrassed to be involved. I had tried to become an electrician instead. Then a filmmaker. Then a teacher. But the company had finally reached a turning point. I was taking over management again and realized how much I needed to learn, so I turned to a book. I bit my lip. "We are called Microcosm Publishing. But we are very small. You probably haven't heard of us." He lit up in a way that seemed curiously appropriate for someone working on Christmas. "I know your books! I love them! I sell them all the time!" I hadn't considered this possibility before, but it made sense. In a building with more titles than I could comprehend, three of our titles had become Top 25 Bestsellers and many had become small press bestsellers over the years as well. A long line stretched behind me but I felt paralyzed. "Good luck being the boss!" he said with an encouraging smile, waving me out the door. The whole encounter lasted no more than two minutes, but it will forever be burned into my brain. The exchange was an emotional microcosm of every experience I've ever had with Powell's Books. Microcosm, a publisher of books about how to empower yourself to create the world you want to see, was a labor of love that I had founded as a teenager, inspired by punk rock and its redemptive powers to steer me away from getting drunk in the gutter and a violent upbringing in a broken home. Raised by my mom on my dad's Social Security checks, I spent as much time out of the house as possible. 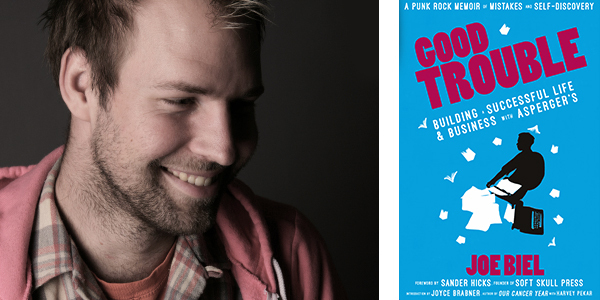 Discovering punk rock gave me hope, and from there I wanted to bring the ecstasy and zaniness that I'd found in punk music to focus my life pursuing and creating punk literature, to help others in the way that it had helped me. As an 18-year-old, I began using $100 from my weekly paycheck at the pizza place to begin to build the publishing house of my dreams. It would be filled with the things that I wished were available to me a few years prior: zines and books that walk the reader through feminism, mental health, queer and transgender acceptance, DIY skills, the history of subcultural movements, and healthy relationships. It felt vital to me that the authors would be peers to the reader, not isolated away or speaking down from an ivory tower. I'd had enough of that in school and every institution that tried to creep into my life. Only punk rock and bookstores had also been there for me when I needed to explore new ideas or flesh out my understanding of — or escape from — an issue that plagued me. When I tried to share my vision for Microcosm with my boss and my teachers, they explained to me all of the reasons that it wouldn't work as a business. Undeterred, I simply ran it the way that I would appreciate as a reader. I kept the books cheap, the development weird, and the content substantial. Management was never my strength or something that I even thought about. Within three years, my house had burned down, I moved to Portland, and Microcosm was selling enough zines and books to replace my full-time job. Soon after, a rain-soaked and dirty version of me sat down with Kevin Sampsell for him to consider stocking Microcosm's titles at Powell's in 1999. For once, I felt no judgment and he had immediate appreciation for the kind of titles I was producing. Despite its size, Powell's buyers recognized Microcosm's uniqueness and became supportive. Microcosm's perceived weaknesses — like low prices and putting my values ahead of accepted business practices — became our principal strengths even in a place where we were surrounded by tens of thousands of other books that had much greater resources behind them. After 10 years, Microcosm began to evolve behind the scenes. I finally accepted that I was not much of a manager and decided that the organization should be run by its staff that had grown to 12 people almost overnight. I figured that since I had no experience, expertise, or education in publishing, expanding our leadership could improve upon our strengths. We could be guided by 13 hearts instead of just one. Unfortunately, the results were that everyone had 12 bosses who had differing visions of what every best practice was. Within a few years, meetings had eclipsed the work that desperately needed to be done and people were burning out quickly. Worse, I was becoming increasingly attached to my vision and having trouble understanding why other people were inclined to make decisions based on their emotions rather than solely based on data about what had worked for us in the past. No matter how many spreadsheets or charts I made to explain what would and would not work, people still wanted to follow their gut instincts. This dynamic made quite a bit more sense when I was later diagnosed with Asperger's Syndrome at the age of 32. Despite a lot of internal problems, Microcosm became successful beyond my wildest dreams. We had a dozen books that sold more than 10,000 copies. Three books even sold more than 50,000 copies and one sold over 100,000. But my argumentative, logic-driven way of solving problems was not what the other managers always wanted. I was often oblivious to their nonverbal communications, upsetting them further. As I watched our debt load increase annually despite my protests, I made arrangements to quit at the end of 2011. As I prepared to part ways, numerous other people quit, leaving only one person managing the company, who began taking on the risks of ownership. It was fitting for her to be the last one standing as she had always been the person that I liked working with best. She was smart, attentive, and hardworking. She was scheduled to buy out my remaining ownership in 2012. Instead, she got cold feet and offered that we split into two companies instead. It took me three years to find time to read It's Okay to Be the Boss. Reading the book helped me realize that I had taken my belief that "we are all equals, we are all experts" to its logical extreme, which wasn't necessarily in anyone's best interest. While I still believe that authors and readers should be peers, it was eye-opening to realize that community could also be built by utilizing individual skills and strengths, by establishing good boundaries and clear rules, and by not being afraid to lead. I spent years learning to manage my Asperger's and develop better social skills. It's turned from a liability into a superpower. I can understand decisions and assess risks mathematically but also listen to people and hear their needs. As I learned to manage Microcosm at its new scale and develop social skills, the implications slowly sank in that I could make it into exactly what I felt that it always should have been. We have become more successful than my teenage self ever could have dreamed of or imagined. The fact that I get to play with books every day and create the ones that I feel are sorely lacking in the world is the greatest gift that I can think of. There's been much misinformation and conjecture over the past decade about the perceived "death of print." But the opposite is true for small publishers in the current landscape — I believe the current sea change is that publishing now favors the small press. Microcosm can grow and publish exactly the books that we want without having to negotiate with other publishers for them. Publishers can work together because there is simply more room to be inventive and creative about books. And part of that is recognizing how meaningful it is to receive the years of support that local stores like Reading Frenzy and Powell's have offered to Microcosm. The level of acceptance and community support that a lost kid discovered after crash landing in Portland is, in many ways, what pushed me to work harder to create my vision. Microcosm turns 20 on February 12 and from all that I am told, our story is unique through and through. It's for the future publishers, the punks who want something bigger than music, and the Aspies for whom I wrote Good Trouble: Building a Successful Life and Business with Asperger's. The book commemorates this marker that I hope becomes a brief blip on a much longer timeline. After the support that I've received from too many people to name — including many Powell's staffers — I became inclined to help other publishers and prospective publishers. What Microcosm is doing is working more than ever. We've published over 350 books (and more than half of our authors are women). Our sales increased 15% in 2013, 28% in 2014, and 23% in 2015. And we've been able to increase what we pay for staff's wages by 322% over the last three years. I still believe in the same values, goals, and visions that motivated me in 1996 and expect to be singing a similar tune in another 20 years! Joe Biel is a writer, activist, filmmaker, teacher, and founder of Microcosm Publishing and cofounder of the Portland Zine Symposium. He shows his films on tour with the Dinner and Bikes program. He has been featured in Time Magazine, Publishers Weekly, and Utne Reader. He lives in Portland, Oregon. 2 Responses to "The Publishing House of My Dreams"
Thanks so much for the support Powell's! You've been so great to us for the past 17 years. Let's keep it up!